I’ve made my massive girl crush on Eva Mendes no secret around here. Not only do I find her gorgeous, but I also admire her feminine, yet retro style. YES, she got a bad rap for hating sweatpants. But just because she swears off sweatpants doesn’t mean her everyday style is impractical. Case in point this causal orange shift dress. I love how effortless and minimalistic it is. It’s a great versatile piece to have in your wardrobe because you can easily dress it up or dress it down depending on how you style it. 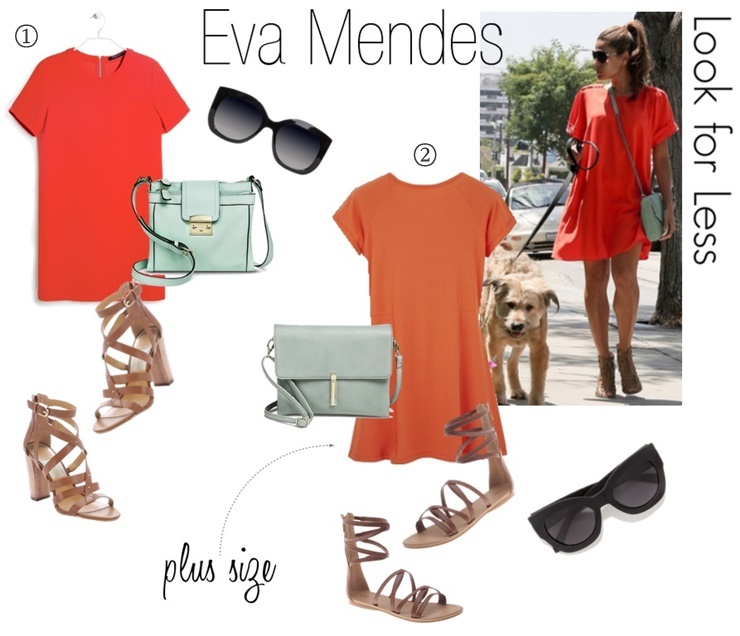 I like how Eva finished off her look with a mint crossbody bag, strappy sandals, and oversized sunnies for chic daytime wear. Granted, it may not be our dog-walking outfit, but it could serve as inspiration for our summer style. Below I recreated the look for less so you can wear the outfit anytime no matter your size!